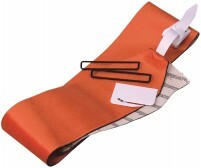 Contour is an Austrian manufacturer that was the first to use mohair on climbing skins. With 40 years of experience, they are the masters of selecting, treating, and fixing mohair reliably under your skis. The company has a strong European following due to the quality and durability of their skins. Junior backcountry skiers have been flying under the radar of product developers; it’s been hard to get properly-sized equipment. When covering junior skis with climbing skins, parents would end up throwing half of the material in a standard kit in the ga..
Mohair skins from the mohair experts. As the first company to use mohair to make climbing skins, Contour knows their way around the barn. 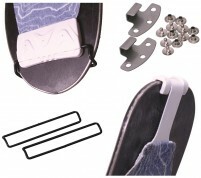 Coupled with attachments that know their way around your ski, the trim-to-fit Guide Cut skins are hard to beat. The f.. 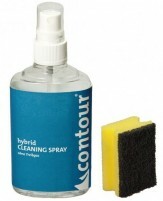 The Hybrid glue system from Contour solves the stickiest skin problem. That is designing a glue strong enough to adhere to the backing but not so strong that you can’t separate a skin from itself. Contour achieved this goal by using multiple layers of glu..
Contour race tips are an elastic with a sewn webbing on top and nylon washer to fit over the ski. Cut the skins, fold them back over themselves, sew or rivet the skin in place, and voila! Race rip ready. Tips do not come with rivets or sewing kit. T.. Tip & tails is the name of a chute in Wolverine cirque, a prominent feature in the Wasatch range. It’s also the primary concern of skiers trying to fix skins to their skis. Contour makes several such kits that could be just what you need to skin to th..
Leave it to the mohair experts to solve mohair’s problems. Crossing from sun-affected snow into shaded snow is a sure way to experience hateful glomming on the bottom of you skins. 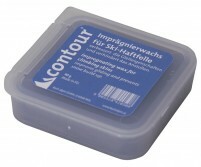 Applying Contour skin wax is a sure way to prevent it. The 40g block of bl..
Take twenty seconds to put a coat of Contour Liquid Wax on one skin and feel the difference compared to the untreated skin. The easiest and most effective way to add glide to your skins while preventing icing. Squeeze some liquid wax through the applicato.. Treat your natural mohair skins with a coat of unnatural chemicals. Naturally, this will improve your experience in spring when snow is wavering between cold and wet. This quick-spray formula helps prevent icing as you skin from shadow to sunlight and bac.. If you have the Contour Hybrid skins (mohair or mix), you’re likely enjoying the easy-to-manage, multi-layer glue formula. The skins stick to your skis yet require little effort to separate when stored glue-to-glue. Keep it that way for years with the Con..